First introduced to the financial markets in 1979, Eric Hadik is a trader and analyst who has been intimately involved with commodities and investing for over 35 years. His work gained wide recognition from the outset, where throughout the late-1980's Eric worked closely with and provided market analysis to major institutions such as BP, Arco, Occidental, Royal-Dutch Shell and Chase Manhattan as well as AMAX Gold and Handy & Harman. In the early 1990's Eric laid the groundwork for what is now INSIIDE Track Trading - founded in 1994. In that capacity, Eric publishes research, analysis and trading strategies with the expressed goal of teaching, educating and sharing his insights with thousands of individual and corporate traders around the world. His articles and interviews have been featured in major financial media over the years, including CNBC, Forbes, Inside Wall Street and Investor’s Daily. E Tavares: Eric, thank you for being with us again today. In our discussions in the pastwe have focused on the financial markets for the most part, but as part of your work you take a much broader view on things. We would like to get your opinion on volcanoes and earthquakes, something that is personal to us as we spent most of our childhood in a small volcanic island. But before we get into that, what is the relevance of these natural cycles for your work as a commodity and financial futures trader? E Hadik: There are various applications to researching cycles like this. Part of that involves the reinforcement and validation of overall cycle analysis. I am able to take what is learned from that study and apply it to related natural studies and cycles, like those of sunspots and solar storms and climate oscillations (including El Niño and La Niña and corresponding cycles of flooding and drought). All of that provides an important backdrop for the study and analysis of the markets - governed by human actions and mass psychology. There are, however, serious limitations to this particular application. The important part is that it does not stop there. In fact, that cycle analysis is only the beginning - a backdrop for more specific analysis that follows. It is next to impossible to trade directly (and profitably) off cycles like those. While it is intriguing to discuss topics like these, I am always looking for the practical application of those studies. My ultimate goal is always honing it to a level where a usable trading strategy can be derived. And for that, I would never rely solely on broad cycle studies. ET: Forecasting occurrences of volcanic eruptions and earthquakes is a very complex undertaking, if at all possible. However, you have found some very revealing regularities. Tell us about that. EH: While I do see some uncanny patterns, I would agree that forecasting the precise occurrence of volcanoes or earthquakes - particularly if one tries to take it to a more regionally-specific level - is next to impossible. From a broader perspective, however, I am constantly surprised by some of the patterns and periodicity that unfolds. A perfect example involves a series of reports I published in 2009 - 2010, projecting a devastating trio of global earthquakes in 2010 - 2011. That future time frame had been discussed for almost a decade and the published analysis specified that Chile, Japan and North America should suffer those quakes, with specific time frames for each published before the fact. The Jan. 2010 Haiti quake, Feb. 2010 Chile quake and Mar. 2011 Japan quake and tsunami fulfilled that outlook with surprising precision (relatively speaking). In doing so, they also reinforced my outlook for 2018 - 2020 to trigger a subsequent spike in volcanic activity. That 2009 analysis involved the synergy of a myriad of cycles, with two uncanny cycles being a 7 year Cycle and a 17 year Cycle. Every 7 years, there had been a spike in the concentration and intensity of earthquake activity. However, it was the overriding 14 year and 28 year cycles that were more accurate and timed many of the most dramatic events. In certain phases of that cycle, volcanic activity has quickly followed. A prime example was the triple-whammy of momentous (and climate-altering) volcanic eruptions in 1991 - Mt. Pinatubo, Mt. Hudson and Mt. Unzen - following an earthquake spike in 1990. 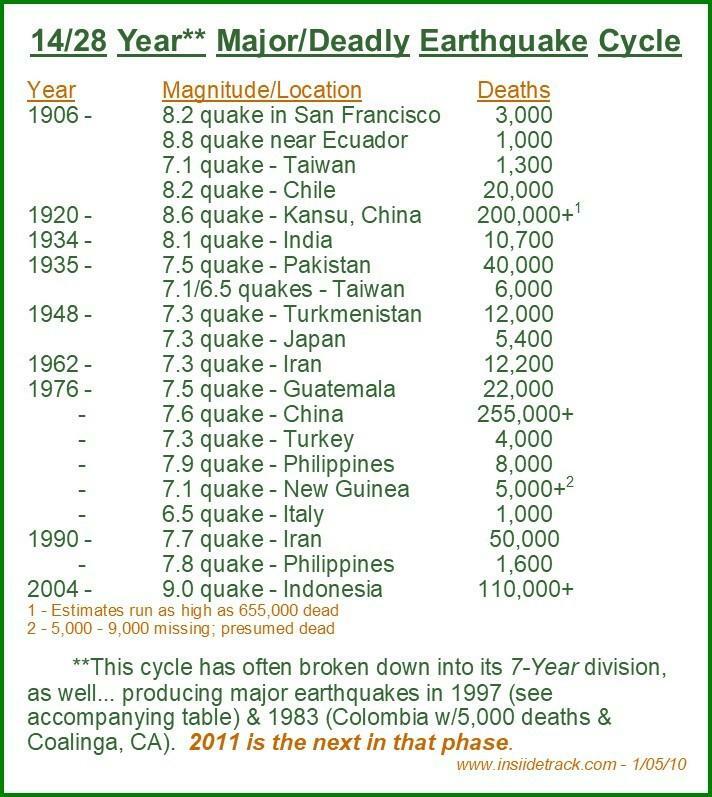 That earthquake/volcano sequence was expected to recur in 2018/2019 - an overarching 28 year cycle (detailed separately), 40 year cycle, ~100 year Cycle and ~200 year Cycle. The synergy is what is most important! The corresponding analysis, in that same Jan. 2010 publication, addressed multi-year earth disturbance cycles projected for the first part of 2010 (1Q ’10) and first part of 2011 (1Q ‘11). That Jan. 2010 analysis was first validated by the mid-Jan. ’10 Haiti earthquake and subsequently honed down, with the focus for a Japanese earthquake falling on 1Q 2011. With 20/20 hindsight, it is easy to see that analysis was tragically validated with the Haiti, Chile and Japan earthquakes in the ~14 months that followed (not to mention dozens of other powerful quakes at that time). If you look at Hawaii and Guatemala, it appears that this dangerous and potentially explosive period - from 2018 - 2020 - is beginning ‘with a bang’. But, I do think they are only the ‘opening act’. That is NOT said to be sensational or alarmist. It is just an attempt to convey some very natural and very consistent cycles that might normally be overlooked. ET: Do you differentiate between earthquake and volcanic occurrences or are they usually tied together in some way? EH: Earthquakes often precede volcanic eruptions by weeks, months and sometimes years. 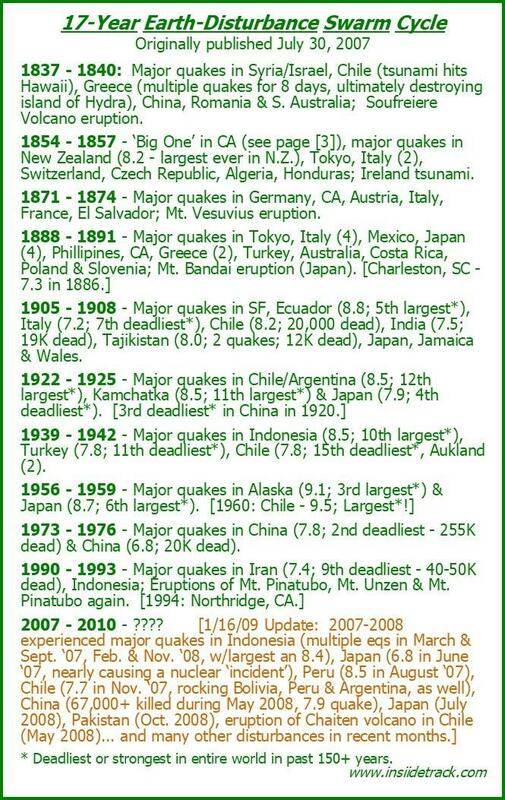 That was proven again in 1990 - 1991 in the Philippines (before Pinatubo erupted), in Mt. St. Helens in 1980, in Tambora in the 1810’s and in dozens of other examples throughout history. More recently, the seismic spike projected for 2010/2011 began with devastating earthquakes in Jan. (Haiti) and Feb. (Chile) 2010, but were quickly followed by the eruption of Eyjafjallajökull in Iceland. For the most part, those seismic spikes involve both earthquakes and volcanoes. ET: What do you believe might be driving these cycles? Some people suggest it relates in part to the solar cycle, though this remains quite speculative. EH: Let me begin to answer that by first emphasizing two overriding principles. The first is synergy. It is those times throughout history when a powerful convergence of diverse cycles aligns that I pay the closest attention. It would be like constructing a Venn Diagram in which multiple circles represent the various cycles that have shown consistent reliability. Each cycle has its own impact but the intersection of three or more - in a specific window of time - is when these cycles have the greatest reliability (although, even then it is FAR from perfect). The same is true with how I approach overall analysis in the markets and why I have been looking for a series of equity market peaks in late-Jan., late-June and late-Nov. ’18 (+ or - 1 - 2 weeks) and for a pair of gold surges - first in Dec. ‘17/Jan. ’18 and then later - leading into 4Q ‘18. The second overriding principle is swarms (another type of synergy). I do not look for a specific cycle to pinpoint an isolated future quake or eruption. Instead, I am looking for those recurring times throughout history when greater concentrations (swarms) of major events occur. Most of my earth disturbance analysis has to do with identifying those seismic swarms and the cycles that govern them. 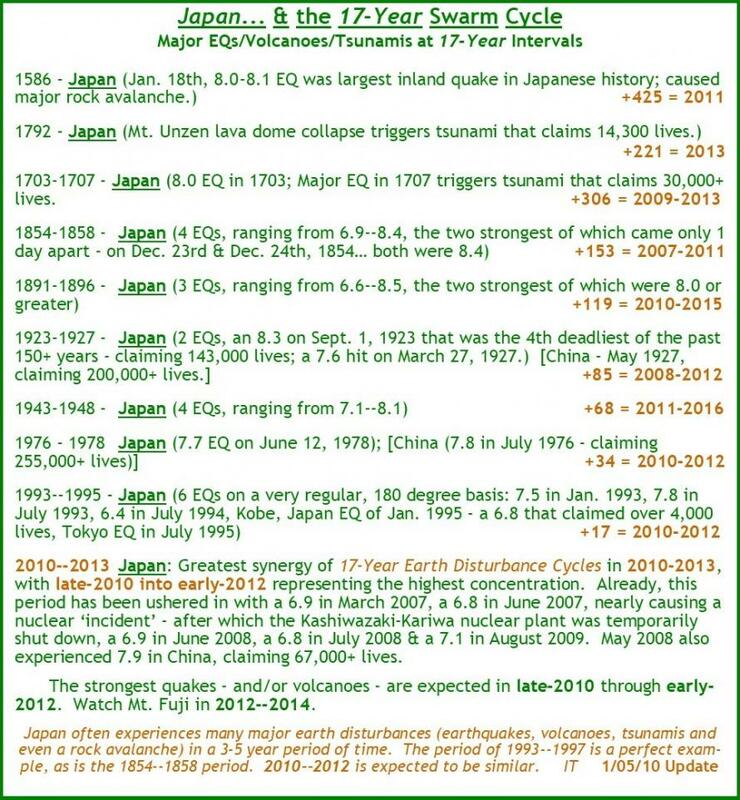 The following is a table originally published in Dec. 2009 ‘Earth in Transition: 3 + 3 II’ Report and then slightly corrected in Jan. 2010, detailing an uncanny 17-Year Cycle of Japan Seismic Swarms - pinpointing 2010 - 2012 (later honed to 1Q 2011) for the next major quake and tsunami in Japan. It is eerie that a previous seismic/nuclear incident in June 2007 highlighted how vulnerable Japan was, in that regard. It turned out to be a very prescient omen. 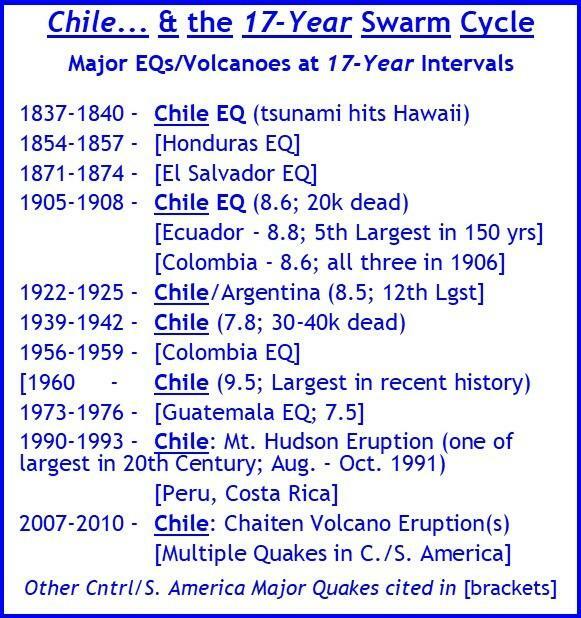 In that same series of ‘Earth in Transition: 3 + 3 II’ Reports, I also detailed a related 17-Year Swarm Cycle impacting Chile - that pinpointed 2010 as the latest culmination when a major quake was expected. And both of those overlapped a global 17 year Earth Disturbance Swarm Cycle impacting the entire globe. These quakes are not just anyquakes. Of the 12 largest and 12 deadliest quakes in the past two centuries, this Swarm Cycle includes a disproportionate concentration (14 out of 24) of those dramatic seismic events in these recurring 4-year windows. So, almost 60% of the largest or deadliest events occurred in a little more than 20% of the overall time. That is statistically significant. It was the synergy of ALL these cycles that screamed for attention. ET: I notice you keep referring to a 17 year cycle, something that is not commonly cited. Can you elaborate on the origin and significance of that or explain why you use it? EH: Yes. In the late-1990’s and then again in 2007, I published a large amount of analysis on the 17-Year Cycle. At the time, I was explaining why I was convinced the stock market was about to undergo a ‘1 - 3 year, 35 - 50% crash’ - in late-2007 - 2009/2010. That 17-Year Cycle had governed, with uncanny precision and regularity, similar stock market declines dating back for more than 100 years. It also created an over-arching 34 year Cycle when more significant declines occurred. The conclusion conveyed throughout 2007 was that the Stock Indices would peak in late-2007 - 17 years from the Oct. 11, 1990 low - and enter a 1-3 year, 35-50% decline. That would mimic what had taken place in 1973-1974 (34 years earlier), 1939-1942 (34 years earlier), 1905-1907 (34 years earlier) and the early 1870’s (34 years earlier). That peak arrived on Oct. 11, 2007 - EXACTLY 17 years to the day from the Oct. 11, 1990 low (the culmination of the Persian Gulf War sell-off and the beginning of the 1990’s euphoric rise) and a ~50% drop ensued. ET: So, a 17 year cycle has had some pretty consistent impact on financial markets. Is that linked to the natural cycles and geophysical instability? In his paper, ‘Evidence for a 17-year Cycle in the IMF Directions at 1 AU, in Solar Coronal Hole Variations, and in Planetary Magnetospheric Modulations’, he describes the ~17 year cycle of ‘interplay’ between the magnetic fields of the Earth and Sun… both on a 17 year cycle. “At Earth, evidence for a similar 17-yr cycle was observed in the horizontal magnetic field observations in a multitude of surface magnetic recording stations. In addition, the detection of a 17-yr cycle in the Huancayo neutron monitor cosmic ray series suggests that the effects of this cycle extend to the heliospheric boundaries. So, the Earth has a magnetic swing (‘to and away’) of 17 years and the Sun has a 17 year‘magnetic moment oscillatory cycle’. Hmmm. Both the sun and the earth have 17-Year Cycles that govern the stability of their cores??? You couldn’t ask for a much stronger validation than that since magnetic swings are at the core of life and of our stability as humans. They are also at the ‘core’ of earth’s reverberations. And wouldn’t that have an impact on tectonic plate movement, magma movement and spikes in seismic instability? I have seen enough repeated validation of these cycles that I no longer need to ask ‘why?’. However, it was certainly nice to have confirming scientific analysis that reinforces those cycles. ET: We are seeing quite a bit of activity, most recently in Hawaii and Guatemala, in quite a dramatic fashion. What is your best guess of what could happen in the coming years? What regions could be the most impacted in your estimation? EH: Based on these cycles, there are different regions being watched carefully during specific time periods in the coming years - and all of them being monitored throughout the entire 2018 - 2023 period. I have been focused on Indonesia (quakes and volcanoes) leading into 2019 - when I expect a type of ‘crescendo’. Also, I am again watching some uncanny cycles related to major earthquakes in or surrounding Iran (on the Alpide Belt) that come back into focus in 2018… with the greatest synergy of cycles in late-2018, particularly Dec. 2018. Japan seismic cycles also converge again in 2018 - 2019, as do some specific South American cycles. And, there are also North American/US cycles in focus, during a separate but overlapping period. These are discussed separately. There are times, like in 2008 - 2009, when a specific region provides a very consistent cyclic pattern of precursor earthquakes - portending a major one in the near future. That is like the birth-pain analogy in which important clues are provided ahead of time - on a regular basis - projecting the likely timing for a future crescendo in those rumblings. In Mar. 2009, the following chart was published - projecting increasing earthquake activity in Chile, leading into a projected major event in 2010. From the beginning of this period, in 2007, Chile began to experience major earthquakes on a 90-degree (~90 days or 3 months), 180-degree and 360-degree sequence. That created an escalating intensification of seismic activity (like labor pains) in Nov. ’07, Feb., May, Aug. and Nov. ’08 and Feb., May, Aug. and Nov. ’09. There were also recurring eruptions of Chaiten volcano, beginning in May 2008 - occurring on the same 90-degree time table. Since 2010 was the culmination of the overriding 17-year cycle, and the year when the major culminating event was most likely, the periods of Feb., May, Aug. and Nov. 2010 were pinpointed as the highest probability for a major earthquake in Chile. February 2010 is when Chile was rocked by a massive, 8.8 magnitude earthquake (just a few weeks after the Haiti earthquake of Jan. 2010 that killed over 100,000). All of that analysis in 2009 (pertaining to 2010/2011) laid the foundation for why 2018 - 2019 has been an ongoing focus for projected volcanic eruptions. ET: In a sense the US is sitting on a time bomb, where a civilization-changing eruption of the Yellowstone supervolcano seems overdue. Even if scientists believe nothing major will happen in the next thousand years, there has been a lot of earthquakes and ground movement there that got some people nervous. What do you think could happen? Any other hotspot worth keeping an eye on? EH I have read enough about Yellowstone activity to get the same sense you are describing… but not enough to feel qualified to comment any further on it. From a cyclic perspective, one would need sufficient data detailing other civilization-changing eruptions to formulate any sort of analysis. That is not the case, except on a VERY general basis. There are many global areas that have a near perpetual sequence of seismic activity… which might just show it is an area of perpetual seismic activity. On a lesser-degree basis, it is a little like the constant emission of CO2 near Mammoth Lakes in California, over the past few decades. That has spurred an ongoing debate about whether that is a ‘normal’ event or a precursor to something far more significant in the future. I don’t know. It is intriguing that Mammoth experienced 4 major earthquakes within weeks of the May 1980 eruption of Mt. St. Helens (though geologists insist there is never any connection) and then a swarm of smaller earthquakes in 2014, the second phase of expected escalating seismic events this decade. Sinabung (Indonesia) is acting in the 2010’s similar to how Tambora acted in the 1810’s, so it is worth monitoring in this potentially-explosive period. 2018 - 2019 is also one 17 year cycle from major eruptions in 2001 - 2002 (Ruang in Indonesia, Reventador in Ecuador, Mayon in Philippines) and the resumption of activity at Mt. Etna and Stromboli (so, Southern Europe should also be watched in 2018 - 2019) - a previous spike in activity. Not surprisingly, Hawaii’s Mauna Loa had its two biggest eruptions in 1950 and 1984 - 34 years apart (the 1984 eruption followed a major Hawaiian earthquake in 1983). Another 34 years in the future is… 2018! Mauno Loa began to stir in the 2001/2002 period (17 years after 1984 and 17 years before 2018/2019), but it never escalated into anything significant. Renewed activity began in 2014, the year that was projected to act as a global precursor to 2018. Looks like the 17-Year Cycle is alive and well in Hawaii, as well. Mayon is another significant volcano with major eruptions in the 1610’s and 1810’s, reinforcing the ~100-year and ~200-year cycles that converge now. More recently, it had a spectacular eruption in 2001 and began 2018 (17 years later) with a new phase of eruptions. While Mayon’s 1814 eruption was overshadowed by Tambora in 1815, it remains one of the most dangerous global volcanoes on an ongoing basis. 2018/2019 was and is a new phase of expected activity, which has been initially validated. ET: Let’s try to tie that to the financial markets. If that cycle unfolds as you predict what commodities should do well – assuming of course you are alive to take action on that front! EH: That would have to do a lot with where the most significant eruption takes hold. The Tambora eruption of 1815 (along with the synergy of other global eruptions in the preceding years) led to the notorious ‘Year Without a Summer’ in 1816. During that year, freezing temperatures were experienced during every month of the year in large parts of the US and Europe - devastating crop production. More recently, Pinatubo (combined with the synergy of Unzen, Hudson and others in 1991) also contributed to lowering global temperatures in the years that followed. Hudson also had a powerful impact on nearby coffee-growing regions. From an overall perspective, my commodity analysis has continued to project increasing inflation from 2016 into 2019, with an accelerated surge likely near the latter part of that cycle. That was detailed in early-2016 - precisely when oil and food prices as well as the Goldman Sachs’ Commodity Index were bottoming and involved analysis on ‘Soybeans (and grains), Sunspots and Solar Cycles’ - all focused on 2019. Following that early-Jan. 2016 analysis, Soybeans did surge into mid-2016 as the first phase of what was expected to be a ~4-year advance. The second phase was forecast for mid-2017 into late-2019 and is steadily unfolding. However, this outlook is also influenced by the 90/10 Rule of Cycles in which a large percentage of the overall price move occurs in the final 10% (or 20%) of the overall cycle. So, when discussing a roughly 4 year up cycle, the majority of the overall price surge could take place in the final 5 - 10 months of that cycle (beginning in 1Q or 2Q 2019). It is intriguing that my stock market cycles have been focused on 3Q 2019 for the culmination of a sharp sell-off, that could also occur mostly in 2019. Gold and silver cycles have related cycles (though from very diverse origins) colliding near the same time - making me wonder if a large natural event could exacerbate whatever financial market struggles are already materializing at that time. It is often not a case of direct ‘cause and effect’ (volcano cycles causing an inflationary move up in commodity prices) but rather a ‘cause and effects’ - where the cause is the overriding cycle of instability and upheaval and the effects are inflating commodities, declining equities, increase in seismic activity and often geopolitical turmoil (and/or military conflicts). 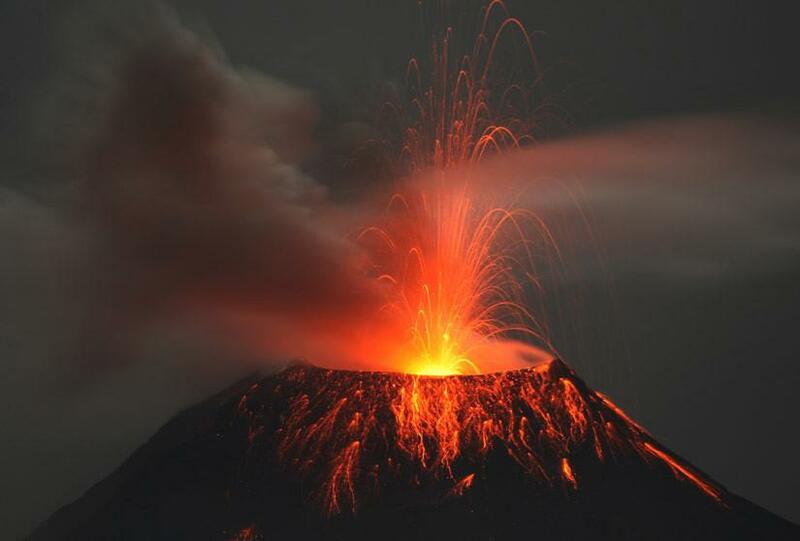 A volcanic eruption might exacerbate an already developing bull market in commodities but it is just a reinforcing factor - not the main trigger. ET: Hopefully people will still get rich from investing in commodities for safer reasons. Eric, for those wanting to get your updated and – pun intended – much more down to earth views on the markets, where should they go? EH: Our primary website is www.insiidetracktrading.com and includes archives of dozens of reports from the past 20+ years, including about a dozen related to these natural cycles. Another trove of archived analysis - primarily focused on the 40-Year Cycle (which comes to a head in 2018 - 2021, both naturally and financially) - can also be found at www.40YearCycle.com. ET: Thank you for your views. And stay safe out there! EH: Thank you, Erico, as always - for giving me the opportunity to share this analysis and hopefully challenge some to explore the uncanny correlation between natural cycles and the markets.